Taking a holistic view, the class will address multifaceted aspects of our experience of the built environment and how the rapid pace of technological innovation affects our relationship to our daily lives and spaces around us. The course takes advantage of the resources offered by the ongoing research project at the REAL lab with the Italian City of Bergamo, and aims to build on that research and open up new research and speculative design opportunities. Bergamo – a typical mid-size European city – offers an ideal case study for prototypical interventions that can be possibly replicated in other contexts. We are excited to share some of the research pursued with our colleagues at the University of Bergamo through a new article on the Journal of Technological Forecasting & Social Change. Drawing on our REAL Lab-UniBG multiyear collaboration, the paper explores design research strategies for the creation of citizen-centered scenarios of responsive environments and enhanced urban experiences, focusing on the longevity and sustainability of technologically driven design. Are we sure that the cities of tomorrow will be smart, sustainable and responsive? Or will they rather be global networks where social processes are determined by induced transnational dynamics? Stefano Andreani in conversation with Domus director Walter Mariotti addressed these and other questions at “The future of cities: a new urban paradigm” conference at the Feltrinelli Foundation for the Brera Design Days 2018. More info on Brera Design Days and Domus. We‘ve enjoyed helping passionate students from CAFA Beijing speculate on the future of technologically enhanced places and experiences. The workshop design concepts will be exhibited at the Central Academy of Fine Arts along with the work by other schools’ international collaborations. On June 28 in Milan Allen Sayegh and Stefano Andreani will give a talk and run a design workshop on “the future of shopping”, as part of the Architecture Meets Fashion executive master organized by Accademia Editoriale Domus. Read the Harvard GSD news here. We are pleased to introduce Domus Innovation 2018, a Domus special issue jointly edited by Allen Sayegh, Stefano Andreani (Harvard Graduate School of Design) and Walter Mariotti (Domus). Domus Innovation 2018 is an attempt to collapse technology, design and the human experience into one and brings forward innovation as the fusion of these paradigms. A collaborative effort between Domus and the REAL Lab at Harvard GSD, this special issue goes back to the fundamental basics of design perception, materiality, interaction, craft and adaptation. Addressing innovation from the global scale down to the micro-world as it relates to the human experience, we explore the dynamic and impactful role of design hybrids to foster enhanced relationships between human beings and their surroundings. The issue ultimately presents alternative perspectives to design-driven innovation at the intersection of advanced research and forward-looking practices for positive changes to our present and future world, and to the ways we will inhabit it. Contributors include: Antoine Picon (Harvard GSD), Sanford Kwinter (Pratt Institute), Martin Bechthold (Harvard GSD), Joanna Aizenberg (Harvard SEAS), Paola Antonelli (MoMA NYC), Sawako Kaijima (Harvard GSD), Aric Chen (M+ Hong King), Jodi Goldstein (Harvard i-Labs). Featured works by: REAL Lab (Harvard GSD), MaPS Group (Harvard GSD), Wyss Institute, INVIVIA, Harvard Innovation Labs, MIT Media Lab. Domus Innovation is on newsstands worldwide, along with Domus 1022 – March 2018. Read more on Domusweb. “Responsive Environments” looks into the future of the built environment from a technologically augmented point of view, with a strong focus on what makes technologies stick and sustainable. By taking a holistic view and putting the human being at the center and forefront, the course examines new and emerging models, technologies, and techniques for the design of innovative architectural human interfaces and responsive environments. This year the topic of investigation will be on the question the shopping experience at the intersection of digital and physical realms. The course is part of “REAL Cities / Bergamo 2035,” a multiyear research collaboration between the REAL Lab and the University of Bergamo with the support of Pesenti Foundation. Read more of the course here. UrbanNext interviewed Stefano Andreani within the Smart City Expo World Congress, Barcelona, Nov 2017. The Harvard Gazette covered the PULSUS project by INVIVIA+REAL through an interview with professor Allen Sayegh. Read the full interview here and enjoy the following video! Allen Sayegh joined a round table discussion at the Central Academy of Fine Arts in Beijing with global design leaders and experts, including Kevin Kelly, Fan Di’an, Joichi Ito, Anthony Dunne and Sputniko! (Hiromi Ozaki). 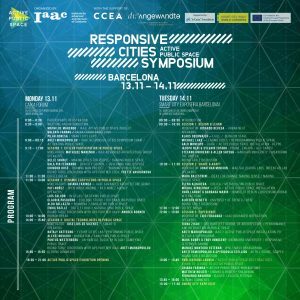 Tomorrow we will be presenting our research on Measuring the Unseen at the Responsive Cities Symposium in Barcelona. Looking forward to discussing the exciting future of technologically-enhanced built environments! This Saturday morning we will be presenting our research on “augmented urban experiences through technologically-enhanced design research experiments” at the ACADIA conference at MIT Media Lab. We hope to see many of you there! Please join us next Monday 25 from 5-7pm at the Harvard Design School for the opening reception of PULSUS. Final review of the REAL Lab ‘Responsive Environments’ course. Within the framework of the “REAL Cities | Bergamo 2.035” research program between Harvard GSD and the University of Bergamo (with the support of Fondazione Pesenti), this year the students developed design projects on urban safety and augmented experiences. DDes 30 event at Harvard GSD organized by prof Martin Bechthold. GSD design research at its best applied all over the world by innovative leaders. Presentation of the ongoing research work of the lab at the Research WIP event at the GSD, sharing ideas and projects with the other Design Labs. GSD and UNIBG students met in Bergamo for a Design Research Workshop within the “Responsive Environments: City eMotion” course and the “REAL Cities | Bergamo 2035” research initiative between the Harvard Graduate School of Design and the University of Bergamo. A great start of the semester for the 2017 Responsive Environments class! The course looks into the future of the built environment from a technologically augmented point of view, with a strong focus on the sustainability and longevity of responsive spaces and artifacts. With the City of Bergamo as playground for the development of alternative research studies and design solutions, this year the class will pursue research on urban safety — particularly on the perception and experiential aspects of safety in both physical places and digital realms. This course is part of “REAL Cities / Bergamo 2035,” a joint research program between the REAL Lab at the Harvard Graduate School of Design and the Università degli Studi di Bergamo, with the support of Fondazione Cav. Lav. Carlo Pesenti. Next Monday July 4th, some of the design concepts developed in the “Responsive Environments: Bergamo eMotion” course last semester will be shared with the City of Bergamo for a discussion on potential further improvements. The event will be attended by the Mayor of Bergamo, the President of the University of Bergamo, representatives from Fondazione Pesenti as well as relevant stakeholders involved in this conceptual phase. Next Thursday 26th at the University of Perugia, Stefano Andreani will give a lecture on Responsive Cities and will guide a workshop with the UNIPG students for the development of design proposals to rethink Fontivegge ‒ a key area in Perugia that includes the train central station and a controversial square designed by the renowned architect Aldo Rossi. The outcomes of the workshop will be discussed on Friday 27th with representatives of the Perugia Municipality and the Umbria Region, as well as with the UNIPG President and faculty from Rome and Milan Universities. 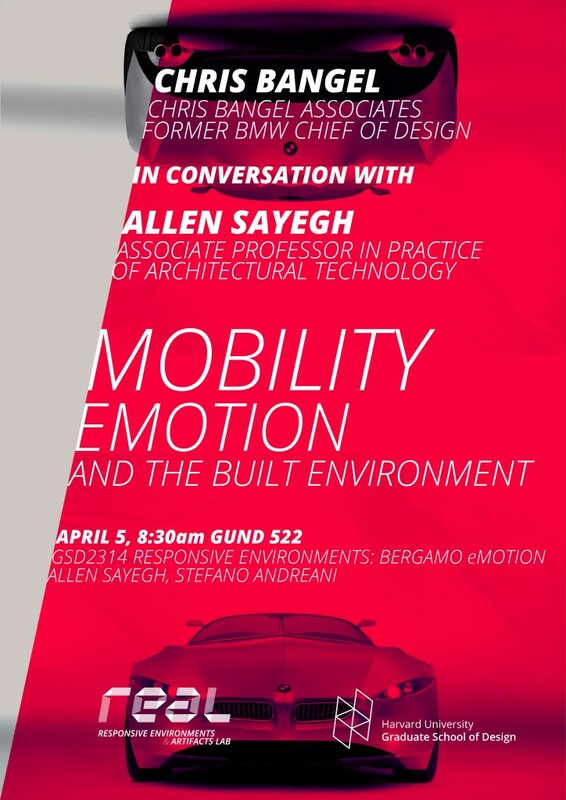 Please join us next Tuesday April 5th for a conversation between Chris Bangel, Principal of Chris Bangel Associates and former Chief Designer at BMW, and Allen Sayegh, Professor in Practice of Architectural Technology and Director of the Lab. The conversation, titled Mobility, Emotion and the Built Environment, is framed within the context of Allen Sayegh and Stefano Andreani’s GSD 2314 Responsive Environments: Bergamo eMotion course, which investigates future urban mobility scenarios and experiences through the lens of human-centered responsive technologies. The course is part of the “REAL Cities | Bergamo 2035” joint research initiative between the GSD REAL Lab and the University of Bergamo. On March 3rd at the University of Perugia, Stefano Andreani will give a lecture on the design of urban campuses and will guide a workshop with the UNIPG students on the design of speculative visions for the future evolution of the University urban campus in the historical center of Perugia. In Responsive Landscapes, Cantrell and Holzman explore the various approaches taken to apply responsive technologies in current landscape-architecture practice. The book is organized into six sections, framing projects through a series of six terms: elucidate, compress, displace, connect, ambient, and modify. The result is a comprehensive view of landscape design projects using responsive technologies and their relationship to landscape and environmental space. Stefano Andreani presented to Italian journalists the 2015-2016 research and teaching activities for the “REAL Cities | Bergamo 2035” initiative. Hosted by the Italcementi Innovation Lab, the press conference featured speeches also from the Major of Bergamo, the President of the University of Bergamo, the Director of Research and Innovation of Italcementi, and the CEO of Mosaicoon. GSD and UNIBG students meet in Bergamo for a Design Workshop within the “Responsive Environments: Bergamo eMotion” course and the “REAL Cities | Bergamo 2035” research initiative between REAL and the University of Bergamo. How can we capture and map out hidden qualities of the built environment? How can we measure the ‘unseen’ in alternative ways? How can we create correlations and find consistencies? The GSD “Genome of the Built Environment: Measuring the Unseen” will explore new methods for the understanding, augmentation, and evolution of urban contexts through the use of responsive technologies. For any questions please contact Prof. Allen Sayegh (asayegh@gsd.harvard.edu) or Stefano Andreani (andreani@gsd.harvard.edu). How are responsive technologies going to affect mobility modes in the city? How can we design in an environment of rapid technological evolution? How can we address technological longevity? How is our experience affected by new disruptive modes of transportation? If you want to help us answer those pressing questions, consider enrolling in the GSD “Responsive Environments: Bergamo eMotion” course. The course is part of a joint research initiative with the University of Bergamo, and will ultimately result in the development of design solutions envisioning alternative urban scenarios. It’s the year 2035. For any questions please reach out to Prof. Allen Sayegh (asayegh@gsd.harvard.edu) or Stefano Andreani (andreani@gsd.harvard.edu).